We took the week off off blogging to celebrate the Independence Day holiday with the Crowe family in Eureka, Il. Over the course of two weeks Alicia's siblings have come home to spend some time together. I had to go back to work, but did find some time to brew beer and pick cherries. Wednesday on my way back to the farm I saw a sign for cherries along the road. I was actually expecting a phone call from my mom but the thought of cherries intrigued me. I pulled up to the farm and there was only a handful of cars parked in the grass. The orchard http://www.steffenscherryorchard.com/ has been around since 1981 and they are continually expanding as adding more trees. After the summer drought and frost after things blossomed last year this harvest was the best in a long time from what everyone was saying. When you get there you are given a bucket a rope and a hook. You can tie the rope around your waist and then hang the bucket while you climb the ladders to pick. I picked 5 buckets that were 6 quarts each. If you want them pitted and washed you can take them to the barn where they have 2 stainless steel sinks to wash them. Then they have a large scale commercial pitted that pits them excellently. 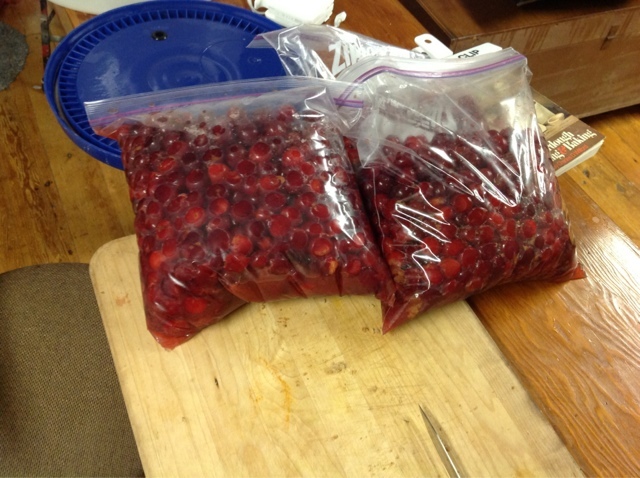 I took home about 5 or 6 gallons of cherries and juice. 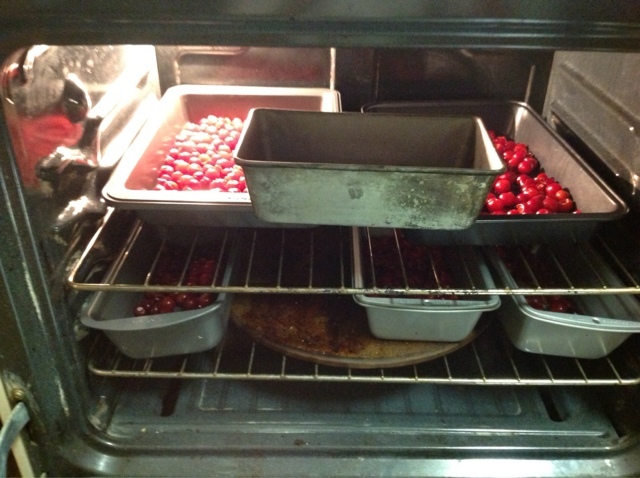 I decide to dehydrate some to make"cherry raisins". I used a regular dehydrator, the oven on low and our solar dehydrator. Had I been around all day to have the solar dehydrator track the sun it would have worked great. The time in the oven (overnight was just a bit much) and would in the future decrease the temp some and move them about more frequently so that both sides were evenly cooked. 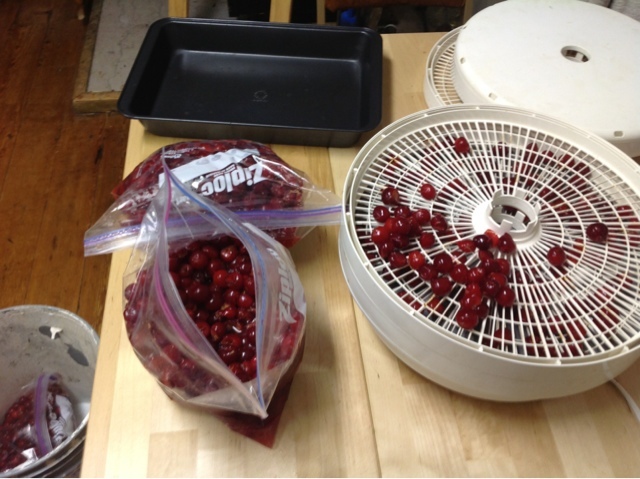 The other thing I did the same night as dehydrating cherries was to make two batches of beer. I made a Scottish Ale and a Stout. I had tried before to make the ale on an outdoor cookstove but it was taking forever to boil so I brought it inside and in the process broke a glass thermometer. Therefore that batch was ruined. Luckily I had only started the process and lost a few pounds of grains. I had to search for the recipe online and made it. By the next day it was actively fermenting and bubbling. This time the thermometer is in tact. Once the brewing time is finished it's time to cool the wort as quickly as possible so that its an appropriate temperature for the yeast. It is important to do it because it causes the solids to break and fall out of the solution so that when I transfer it top the fermenting vessel they don't come with. 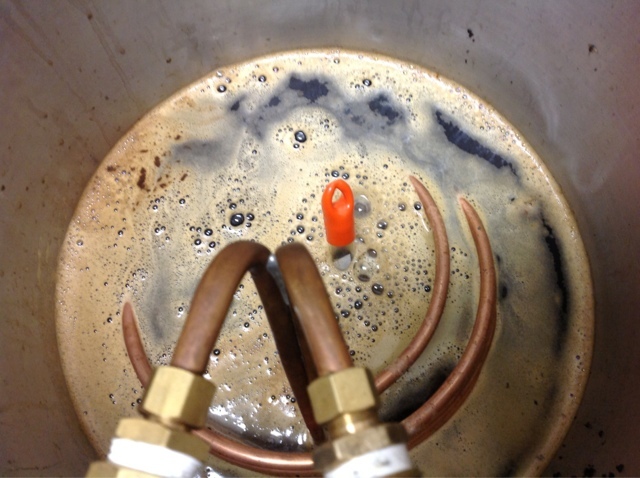 The rapid cooling also prevents other bacteria from taking a hold before the desired yeast strain can. In addition it prevents the formation of "dimethyl sulfide (DMS) production. DMS is a volatile substance produced in some worts, mostly those made from lager malts. 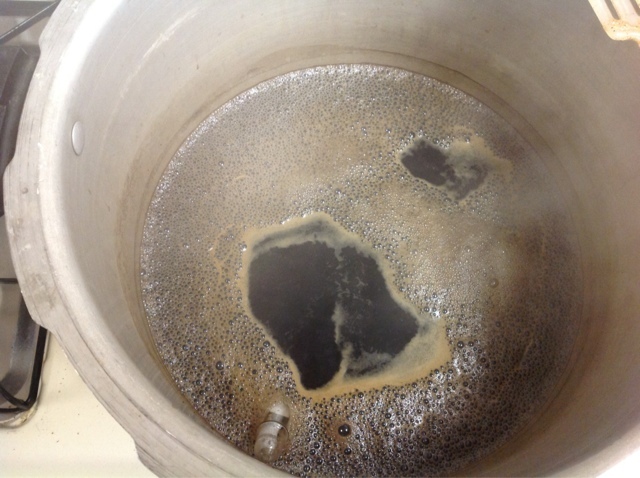 DMS smells like cooked corn and is usually considered a beer fault, although it is noticeable and intentional in some commercial beers (byo.com)." In this picture the cold water is flowing through the hose on the left and goes through the sealed copper coil and comes out warm to hot on the right hose. This was the first time I was able to do it inside. 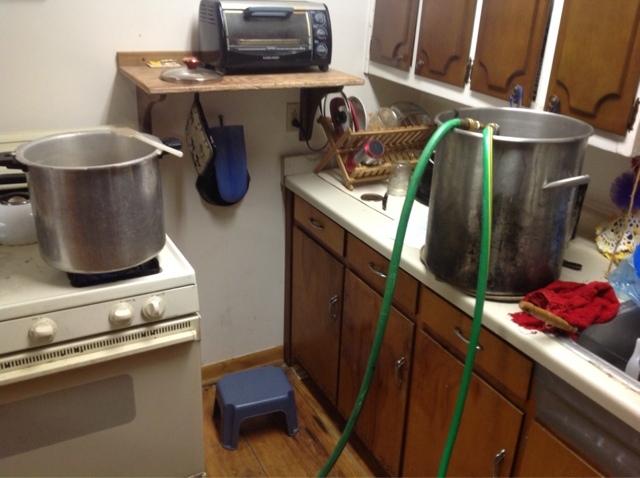 It was very successful in bring down about 3 gallons of boiling wort to 70 degrees in about 20minutes. After it was chilled I transferred it to a fermenting vessel and pitched in the yeast. Then it was time to wait for the fermentation to begin.